The world could use some good news. Here, in what presently seems to be the darkest of timelines and at a point in which compassion and basic human decency seem especially scare, it’s easy to drown in the deluge of negativity and hardship that washes over all of us on a daily basis. During such harsh times, it’s important to cling to the occasional bits of positive press that provide momentary respite from the increasingly unpleasant state of the world around us. When something uplifting breaks the trend of bad news, it’s to be cherished. When that uplifting thing comes from something terrible, it’s a reminder that things won’t always be this way. Last spring, Milwaukee was treated to a strong dose of positivity with news that a family of Syrian refugees who resettled in Milwaukee would be opening a restaurant in their new city. After fleeing war-torn Syria, Riham Silan, Abdul Abadeh, and their three small children spent three years in a Jordanian refugee camp. Thanks to the assistance of a Syrian-born local doctor named Ahmad Nasef, the family was able to come to Milwaukee in late 2017. Now settled in their new home, Silan and Abadeh have the opportunity to operate their own restaurant. Earlier this month, Damascus Gate Restaurant (807 W. Mitchell St., 414-810-3561) opened for business. The inspiring story of a family’s perseverance and the generosity shown by members of our community surely helped convince locals to pay a visit to Damascus Gate. In these especially discouraging times, we recently stopped by the new refugee-run establishment to warm our soul and to try Damascus’ traditional Middle Eastern fare. The space: Damascus Gate Restaurant is a bright and inviting beacon on bustling Historic Mitchell Street. The soothing yellow paint job and shimmering floor make the restaurant a comfortable place to dine in. We walked partway down the long dining room corridor and took a seat at one of Damascus’ 13 tables. The set-up is simple, with portraits of landmarks, some fake plants and artificial flowers, ceiling-mounted light fixtures, and a partially stocked deli counter accounting for the entirety of the restaurant’s decor. It’s simple and absent of frills, but it’s sure to continue taking shape as they settle into the space (which was most recently the site of Salas Burgers after a short stint as Club Lex). Even if no further updates are made, the food itself does all the heavy lifting. Milwaukee Record‘s food: Damascus Gate’s menu is fairly small. Though everything they offer can fit on one side of a place mat-sized sheet of paper, you’ll find a wide variety of options on hand. Beyond the rundown of traditional Middle Eastern appetizers, sandwiches and platters, diners can enjoy pizza (yes, pizza!) and desserts. Nothing costs more than $15, and only one option tops the $11.99 mark. We started with that one. 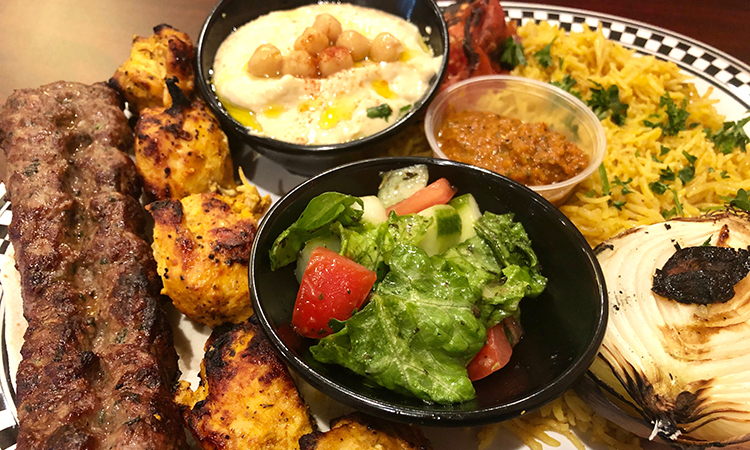 The mixed appetizer plate ($14.99) is a massive metal tray that’s covered with a menagerie of Middle Eastern mainstays. As we waited for our main course, we dipped warm pieces of flatbread into rich and flavorful hummus and baba ghanouj, and accented bites with alternating forkfuls of elegantly-spiced mousakaa and fresh tabbouleh. Vying with the baba for supremacy among the starters was the dense duo of fried kibbeh. Coated in cracked wheat, the balls of halal beef and onion delivered a definite umami that, when combined with a dash of hummus or ghanouj and a savory pickle medallion, was nothing short of divine. Honestly, we could have subsisted on appetizers alone, but a combination of curiosity and thrift found us forging onward. We ordered a grilled meat entree ($11.99) that included tender pieces of skewered chicken, seasoned lamb meat, a salad, more hummus, half a roasted onion and a roasted tomato, and rice. The subtle sweetness of the rice (perhaps provided by cinnamon or nutmeg?) paired perfectly with succulent bites of savory grilled meat. And though we couldn’t begin to explain what the light brown sauce was, that didn’t stop us from putting it on everything. As we devoured the meat entree, we enjoyed a bowl of Damascus’ thick and hearty lentil soup ($3.99). Finally, we finished our feast with one of our favorites: a falafel sandwich ($4.99). Despite its sub-$5 price, the sandwich was huge. It was more than a foot long and its ends extended off the plate. The grilled flatbread gave way to crunchy balls of falafel, pickles, and pieces of diced tomatoes. As we somehow ate the whole thing, we bolstered each bite with the addition of hummus, baba, and mousakaa that helped make an altogether astounding vegetarian sandwich even better. Though we attempted to sample everything, we simply ran out of space (both internally and on our table) to try the pizza, either of the fresh pies, or any Syrian rice pudding. All told, a meal that could have held over a party of four came to a grand total of $42 before tip. The verdict: Damascus Gate and its courageous, resilient proprietors have a backstory that should inspire anyone with a beating heart to come in at least once. However, those inspiring circumstances come together with outstanding food that’s sure to bring people back again and again.